The choice for the chassis does not leave any doubt about whose signals are supposed to get mixed together here: The device can hardly be distinguished from an SDS1000, MTX9 or TMI. 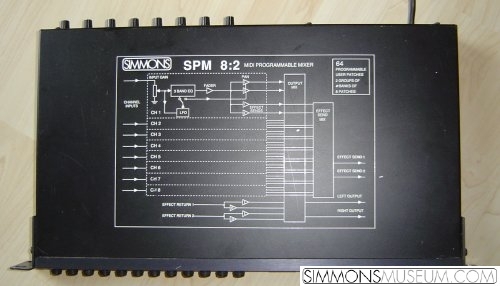 The SPM 8:2 is an 8 channel line mixer whose parameters can be stored and organized in 64 user patches which can be demanded via midi or foot switch. Each channel offers a 3-band eq with parametric mids as well as two (mono) effect returns with adjustable gain and pan. The input gain can be adjusted (unfortunately only) on the backside. All in all a very cool and useful device with professional features. Useful not only for Simmons nerds. Probably a bit to noisy for studio work.